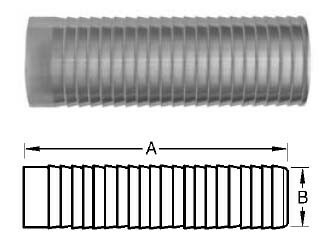 # SAN14WHRL-R200 - Buttweld Long Hose Adapters - 316L Stainless Steel - 2 in. Dimensions - A: 4.5 - B: 2.03 - Nominal Wall: 0.116 - Suitable for use with band clamps. - Use of PVC tubing requires special techniques to prevent leakage. All assembly work must be done with heated tube. Cold durometer is 90 as opposed to rubber hose at 65 to 70 durometer. Banding buckles must be at 180 degrees from one another.